I was pretty excited to see that there will be some new DC Fast Chargers coming to my area! In fact, just yesterday, three new chargers were commissioned; one in the Madison area, and two in the Milwaukee area. I was working in Milwaukee today, and thought I would stop in to check out one of the new DC Fast chargers. I happen to drive a Mitsubishi iMiEV – the electric car with the smallest battery pack (and shortest range) of any commercially-built Battery Electric Vehicle in the United States. The official EPA range per charge is 62 miles. I live about 35 miles from downtown Milwaukee. In good weather, and given enough time to take the backroads, I can just barely eek enough range out of the car to make it there and back without charging. Today, I had to make part of the trip on the freeway (which drains the battery faster.) So, I thought I could see the charger, test that it’s working correctly, and get a little juice for my drive home. The first thing that I noticed is that they had done a GREAT job on painting the parking space! 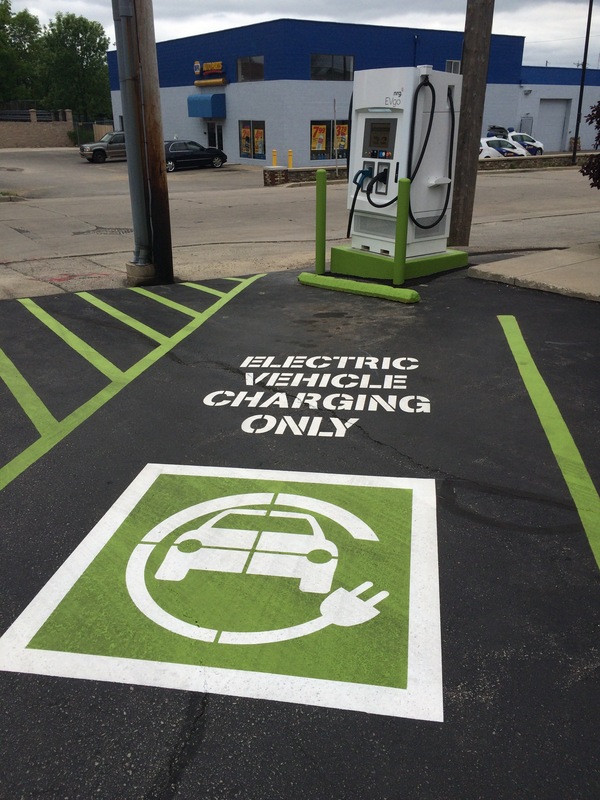 Bright green painted lines and lettering clearly make it known that this space is not just for any car to park in; it’s an ELECTRIC CAR CHARGING SPACE! The space was the very last one in a line of angle parking. Unfortunately, angle parking always seems to make things farther away! The CHAdeMO quick-charge connector on the Mitsubishi is on the back left, which would be the FARTHEST point of the car from the charger. I pulled in, all the way, just to see if the cable would come anywhere close, and of course, it didn’t. I backed the car out, spun around, and backed in. The cable would now reach, although the CHAdeMO cable was on the left side of the charger, and the car’s charging port was now near the right side of the charger. I checked again, and even though the cable had to be brought back around oddly, at least it reached. Next, I went to the touch screen on the DC Charger. The screen was bright and easy to read. It featured images of the two connectors, and invited me to pick which one I wanted to use. I selected the CHAdeMO cable and advanced to the next screen. That asked me to tap my EVGO card. Eventually, the machine timed out and went back to the default “Choose Your Hose” screen. This time, I dipped my credit card into the card reader. Nothing. I spun my card around and tried again. Still nothing. I used a different card. Same result. I finally consigned myself to calling the Customer Service phone number. I was able to get in contact with a real live human being. He was pretty helpful on the phone and was able to take my credit card information. I confirmed that the car was off, plugged in the CHAdeMO cable, and Customer Service turned the charger on for me. Instantly, I could hear the large cooling fans inside the machine roar to life, and the car started charging at 100 amps. I headed inside The Outpost to use the bathroom and get a cup of coffee. While sipping my hot beverage at the coffee corner of the store, I had a chance to ponder the economics of DC Fast Charging, and I think I got the short end of the stick. Before starting the charge, Customer Service informed me that it would cost me $10.51. I reluctantly agreed. I really could use a little juice, and more than anything, I just wanted to test out this charger to make sure that it would be available and useful to me in the future. I also wanted to post notes to PlugShare to let other EV drivers know about the new charger, so they could make use of it too. Although I really only needed a little electricity, my only option was “per charge”. It was a FLAT RATE of $10.51, regardless of how large my battery was, or its state of charge. For the most part, CHAdeMO stations usually charge to 80%. Some stations will charge a little higher than that or you can stop and restart the charge to continue charging, although at a lower rate of current. In this case, I had just a little less than half a charge. The iMiEV has a 16 Kwh battery pack. 80% of that is 12.8 Kwh. And since I had about half a charge, that meant that I would get 4.8 Kwh of energy from my ten dollar charge. Heck, let’s round up to 5 Kwh to be generous and make the math easier. 5 Kwh is good for about 20 miles of range. Perfect. That’s more than enough to get me home with no worries. I could even take pretty much whichever route and whatever speed I’d like and still be fine. When we look at the economics, 5 Kwh of energy for $10 means I paid $2 per Kilowatt-Hour. But how much does one kilowatt-hour or energy normally cost? To find out, I looked at my home electric bill, added in all the taxes, my “renewable-sourced electricity” fee, and my meter fee to find a total amount, and then divided by the number of kilowatt-hours I used. My TRUE cost per kilowatt-hour at home comes to……… 13.2 cents. That’s right, in this particular case, charging in public cost me over FIFTEEN TIMES as much as it would have cost to charge at home. Think of it another way. At the gas station closest to my house, regular unleaded costs $2.45 per gallon. Imagine if some other station was charging 15 times that – $36.75 PER GALLON! Unheard of! Also, my only option was a flat rate per charge. Can you think of a gas station that would charge a flat rate per tank of gas? What about a large truck versus a small car? What if your gas tank was already mostly empty or mostly full? How would that be a fair way to pay for gas!? To be fair to NRG EVgo, they do have other less expensive options. For example, I could sign up for a subscription. In that case, I would have a monthly fee of $14.95, a one year minimum, and an early termination fee of $29. But in exchange for that, a 30 minute charge would cost only $3.00. A gas car driver could buy a little more than a gallon of gas with the same three bucks, and the average new car gets 25 mpg, so $3 would get a gas driver about 30 miles of travel. As long as my battery was less than half full, I’d get MORE than 30 miles of range, so I would start to feel like a winner EXCEPT, the gas driver never had to pay any sort of monthly fee to a gas station! The only way that the monthly fee makes sense is by doing a LOT of public quick charging, and at that point, there would be very little FINANCIAL savings over just driving a gas car! But lets look at it another way. What would a Tesla Model S, with it’s large battery pack get for the same $10.51? According to a station operator, a Model S would typically get 22 Kwh in a 30 minute CHAdeMO session. That would work out to about 48 cents per Kwh. That’s roughly the same cost per mile as a 25 mpg gas car paying the current low $2.50 per gallon in my area. So, not as cheap as charging at home, but no less expensive than gas either. More likely than not, a Tesla driver would simply have the range to NOT need to use this particular fast charger, or the driver would be traveling and stop at one of the three different “free” Tesla Superchargers in south-eastern Wisconsin. Larger battery packs eliminate the need for quick-charging, with the exception of only very long trips. It makes me wonder about the need for DC Quick Charging once the GM Bolt and Tesla Model 3 arrive. On the other hand, some of the car manufacturers are throwing in “Free Charging” with new vehicles. 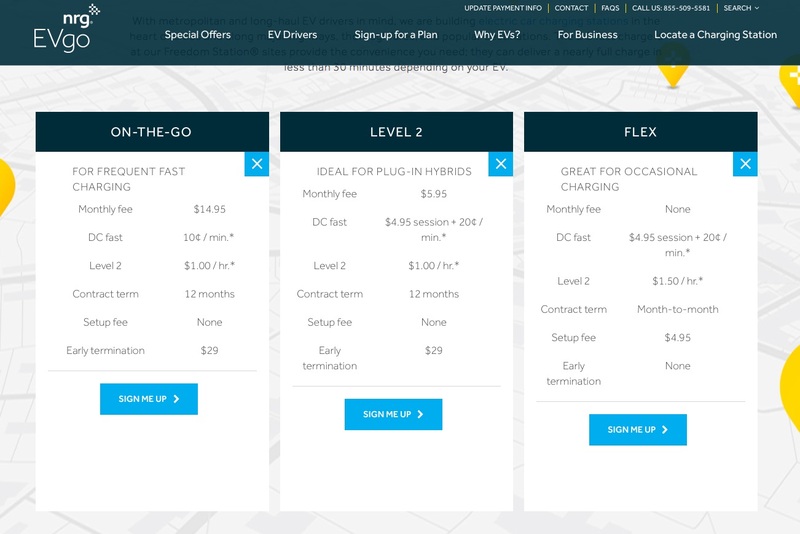 BMW, Ford, and Nissan all programs for free charging in some cities when you lease or purchase a new car. Certainly THOSE drivers could make great use of these charging stations. Oh wait. I just checked the fine print of those programs. The Ford program is only for Level 2 charging and neither the BMW or Nissan programs include Milwaukee. Oh well, those Tesla Superchargers are starting to look pretty good right now! So, enough on my rant against the ridiculous cost of using this charger. What’s it REALLY mean for you and me? 1) Having charging stations in public is a good thing. The more the merrier. 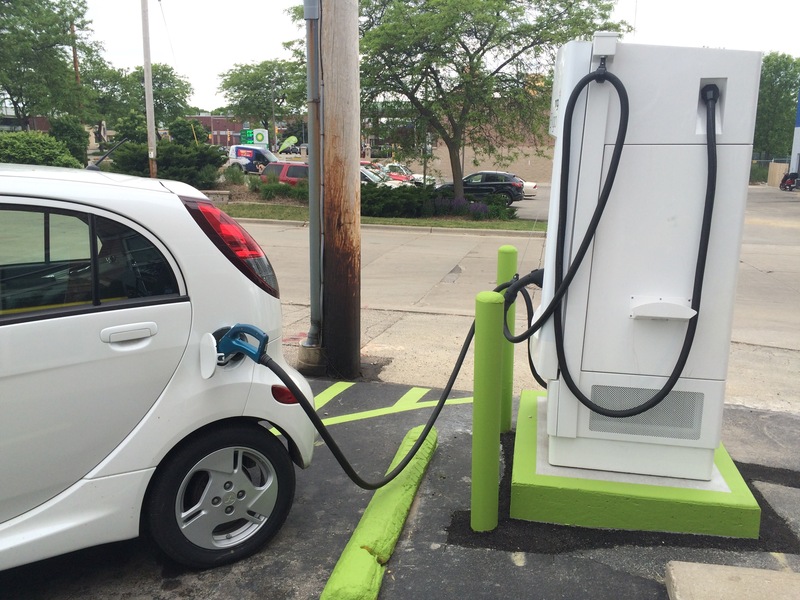 It’s important to have charging stations AVAILABLE for EV drivers to use. 2) Will I use one like this on any regular basis? No. I’ll charge at home where it’s nice and cheap, thank you very much. 3) Will I EVER use a charger like this again? Probably. If I need to. It would be nice to have for a special trip or emergency. I guess what’s really bothering me right now is how INCONSTANT pricing and availability of charging is. I can stop at any gas station, and there will be multiple gas pumps – often as many as a dozen – all in working order. The price of fuel from one gas station to another is often identical. I can swipe my credit card at any gas pump, and it just plain works. I don’t have to be a member of Mobil or pay a monthly fee to Citco just to use their pumps! So why doesn’t Public EV Charging have this figured out yet! 1) We are in the Wild West of EV Charging. This is new. Folks are all trying to figure out the best way to do this. 2) EV charging is just DIFFERENT than filling a tank with gas. It’s a completely different type of fuel, different level of energy, and how we go about it is just plain different. It’s like trying to compare Apples to Orangutans. Well, until we do figure it all out, I’ll keep charging at home, saving about $100 a month by not buying gas, and do so on renewable energy. Stop by any time. I’ll loan you a cup of electrons. *PS: I was able to get in contact with one of the people working on these chargers and was told that the credit card readers won’t be working for a couple of weeks still. It appears that there’s some sort of software upgrade that still needs to be done, and therefore these stations aren’t “Officially” open yet! They will work with the subscription cards right now though! 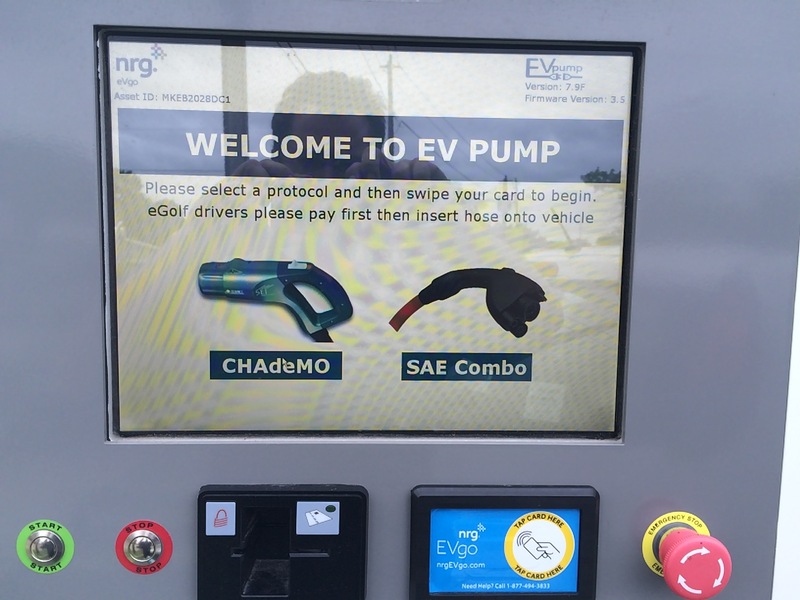 eVgo also offers a pseudo-membership. That is, I have a card with them, don’t pay a monthly fee, and can use the station at a lower cost than non-members. In California anyway, they charge by the kWh and not per the session. Other stations here, like Blink or ChargePoint, also charge by the kWh. Blink members pay $0.59 per kWh at DCFC, for example, which is far more reasonable than what you’ve quoted. The problem is the unreliability of Blink stations. I think eVgo offers different deals in each state — for some unknown reason. Ah, the perpetual comparison to gasoline. I suspect that this will go on for many years, until folks forget about gasoline. Oil is a worldwide commodity, with a fluctuating price that uniformly affects most of the world at the same time. So, gasoline is the same across the street, whether the price goes up or down. The only significant price differences in gasoline amount to the taxes paid, and what a local market will bear (uber area gasoline is generally cheaper than suburban gasoline). The price is “free market” at its finest. Electricity is entirely a different beast. It doesn’t come out of shale or out of the ground at a mostly uniform price… it has to be produced. The price to refine oil into gasoline is also a relatively fixed number, but the cost to produce electricity can vary wildly. Commercial electricity in the US can vary from 6 cents to 23 cents per kWh. The charging station in Arlington, Oregon is permanently closed. It has one J1772 plug, and one dual protocol (CCS / CHAdeMO) Efacec DC fast charger originally set at 120 amps (about “50kW”), then subsequently reduced to 60 amps (about “25kW”) to mitigate “demand fees”. Arlington is a very rural area, but an important crossroads for EV travel in the region. There absolutely needs to be a charger there. But, the electrical power has been turned off since August 2015 by Pacific Power and Light (phone 888-221-7070). The utility meter number is 58-949-638. In a nutshell, the electrical power for this site cost almost $1 per kWh with all fees rolled in, including maintenance of a significant debt of $10,000 to get new electrical service. That means the COST to power a Nissan LEAF could be $24.00, and up to $90.00 for a Tesla Model S/X. That doesn’t include the cost of the $30,000.00 charger, plus the fees to OpConnect for networking, plus any cost for the site, plus maintenance, plus insurance, etc. The peak usage at this site is 410kWh per month, with an average of 190kWh. Imagine how this affects a charging station near you, perhaps in an area that doesn’t have cheap electricity. Before somebody offers that if they only lowered the price in some magic way, more EV drivers would show up, please note that I never mentioned the price that the consumer paid. The sad part is that the gas car driver is paying a large percentage of his cost in taxes, and not for the fuel itself. Those taxes are for the roads and other expenses related to our public infrastructure. Today the electric car charging isn’t even paying those taxes to maintain the roads and infrastructure. Sadly once they start treating electric cars the same as gas the taxes and fees will actually mean that the cost of driving electric is going to cost us more than it does today in a gas car. Today we should be thankful that it is so cheap to drive an electric car if you can get past the high cost of entry to get into a new electric. I see some attractive prices on some used Leaf’s now that has me looking and considering, but range anxiety and limited public charging locations has me hesitating. The high cost of charging on public chargers and very limited access to those chargers is going to be a serious problem for the adoption of electric vehicles. It will take public investment into this infrastructure to make this both affordable and accessible. It is the old chicken and the egg argument. In this case with the popularity of the Tesla it appears the public is prepared to make the jump. So if they build the infrastructure and keep the costs “reasonable” people consider an electric vehicle. But not if it is anything like you just described in this post. Thanks for sharing. High Capacity Public charging stations can be a nightmare. They are expensive to install and they cause the owner lots of headaches (complaints from users and non-users and extra maintenance). As more electric vehicles get on the road, there will never be enough stations to keep up with demand. As an electric vehicle driver you can never rely on a public charging station being available. You don’t know if someone will beat you to the spot (another electric driver, or a I.C.E. driver), or if the station will be broken down. I’ve seen a line of Teslas waiting to charge at the Telsa Superchargers in Chicago. In one planned charging stop, I’ve had to move to the forth charging station location to get a charge (station 1 had ICE cars blocking, station 2 broken down, station 3 had a Leaf on charge, station 4 was Level 1 only, but I took it, it was the last option available and I was already late for my appointment). There will always be people trying to park in the electric vehicle spot (reserved or not). In this case, you will have unhappy electric car drivers (who cannot charge), and unhappy non-electric car drivers (who can’t park there or get ticketed for doing so), and unhappy EVSE owners who paid a bunch of money only to get headaches in return. The best advice I can give a prospective EV buyer: Select a vehicle that has sufficient range to not need charging during the trip and/or plan on paying a premium in time and money to charge in public places. The best advice I can give a merchant on the EVSE installation location is this: install the EVSE in the most unused, undesirable location possible. That way, hopefully only someone really desperately needing a charge will park there.